The RMS Titanic has always been intricately linked with the harrowing realities of social segregation in a life and death situation and the devastation of choices made by just a few people who were more focused on making headlines, than the safety and comfort of all passengers on board. While the tragedy is one of the biggest of the 20th century, it can be difficult to truly understand how it impacted those involved and the immense pressure the crew were under, and this is something that the musical has done impeccably well with characters named after real Titanic passengers and crew members, and beautifully haunting musical numbers that tie the individual stories and the ship's disastrous maiden voyage slickly together. Focusing on not just one or two key characters but a selection of people from all three classes on the ship as well as crew members, from the captain of the Titanic right down to a bellboy, this is a musical that is compact in size but epic in story and execution. From the moment the haunting tones of the Opening and Godspeed Titanic rang through the intimate Charing Cross Theatre the audience was transported from the somewhat sweltering auditorium to the choppy waters of the Atlantic. The two levels of the Titanic set seemed far larger than its actual size due to clever staging and use of the auditorium for added space, and the voices of the 20-strong cast carried beautifully within the theatre, creating the illusion of a much bigger group of people sharing the stage than there were. The doubling up of characters added to this feeling, though for each of the actors there was one character they portrayed that was most memorable. Particular stand-outs were Victoria Serra as Kate (one of three Irish Kates we meet in third class because, as she says, they're all named Kate), who became more intriguing with each passing day; Scott Cripps as First Officer Murdoch, who is consumed by guilt because he made the order to try and go around the iceberg; and Claire Machin as Alice Beane, a woman in second class who just wants to dance with those in first and whose antics added lightheartedness to what could've easily become a consistently depressing two hours of theatre. Despite the large cast of characters, the intertwining of narratives and clever changes between scenes meant that the audience got to know each and every one of them before disaster hit. This of course made the inevitable ending all the more devastating and as the Titanic slowly but surely went down, with just a few of the people we've come to know in the previous hours having made it to the lifeboats, the emotional impact was undeniable. And if a show where the ending is so well-known is still able to have such an effect on its audience members then you know it's a good one. Add to that the beautiful music by Maury Yeston (I cannot get The Proposal / The Night Was Alive out of my head and just thinking about Godspeed Titanic Reprise makes me tear up) and an absolutely sensational cast (why Victoria Serra isn't opening big West End shows already is beyond me), and it creates an outstanding and memorable production putting the Charing Cross Theatre back on the London theatre map. It's been a while since I visited this theatre as I saw several shows in a row that were disappointing, but when the announcement came that it was under the new artistic direction of Thom Southerland (who also directed the aforementioned Grand Hotel), and the production of Titanic I'd already seen at Southwark Playhouse was being revived, I was keen to visit the Charing Cross Theatre once more and I am very glad I did. It was a great experience and I'm now incredibly excited for the rest of Southerland's first season there, in particular Ragtime. With Titanic, the creative team and cast have shown that the small theatre space underneath the arches of Charing Cross station can put on a production of epic proportions. 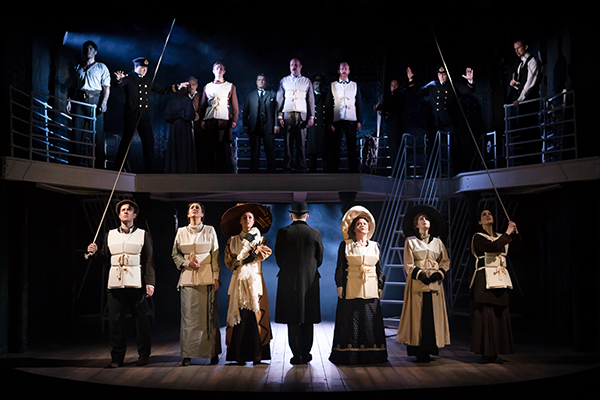 Overambitiousness may have been the downfall of the real Titanic, but this sensational musical adaptation sails the Charing Cross Theatre into a glorious new area of theatre. Titanic is playing at the Charing Cross Theatre and taking bookings until 6 August 2016. Book your tickets here.